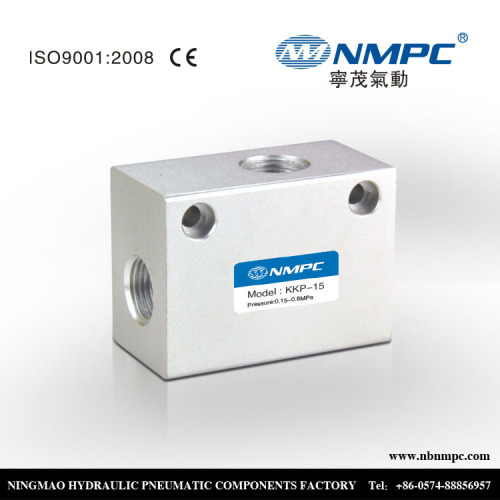 exhaust valve , It is installed between the air cylinder and directional valve ,making the air in the cylinder escape directly through this valve not through directional valve . We Mainly do solenoid valve ,pneumatic valve, air treatment units, air Cylinder, quick connection fittins and PU tube .4V. 3V.2V.2p .solenoid valve ,and 4A.3A Pneumatic valve sell so hot in Asia, Europe,and Middle East. Our products passed ISO9001:2008 and CE Quality Certification. Brand name is NMPC. We have so many distributors and agent in mainland of China. You can send us email or inquiry at Alibaba directiy. 3.How to make the payment? We accept Bank T/T, Western Union and Trade assurance on Alibaba. 4. Is there cheap shipping cost to import to our country? For small order,express will be best.And for bulk order,sea ship way is best but take much time. For urgent orders,we suggest to ship by air. 5.Can we make customized product? Yes, we are good at making customized products. We stand behind the quality of our products 100%. All of our items come with warranty to give you a peace of mind. New Guaranteed: All of our items are in BRAND NMPC condition in OEM or Original Packaging.Orders are packaged with care to make sure your items arrive in perfect condition. if you have any question to air check valve ,please contact us .